Most, but not all, of the pretty “silken” tea bags are made of food grade plastic, nylon or polyethylene terephthalate (PET). Food grade plastic does have a melting point well above 212 degrees Fahrenheit (the temperature of boiling water). However, these plastics do start to break down at 169 degrees Fahrenheit, so it is possible for them to start leaching their polymers into the hot water (Orci, 2013). We forget that plastics have not been around for very long in the food arena – 1980s is when they really took off. There are plenty of studies looking at all types of plastics to figure out what they do and do not put into food. In the meantime, paper has been used for centuries to filter water and is known to be safe. The “paper” flavor that some claim is imparted on the tea leaves really comes from user error. Like loose tea, tea in bags goes stale. In fact, it actually goes stale faster because the tea pieces are smaller. So don’t buy boxes of 100 plus tea bags unless you plan on at least using one tea bag a day. Buy them in smaller quantities and use quickly. For storage, it helps if you get them out of the paper box and put them in a canister or Tupperware. It will slow the process of moisture and unwanted smells making their way into the tea bags. Also, don’t leave your tea bag in your cup. Given the small particles, your black tea will brew in 2-3 minutes instead of the 5 minutes needed for larger loose leaf tea. You are less likely to taste paper if it isn’t floating in your cup while you sip. You can compost your paper tea bags and they will actually dissolve. The mesh tea bags made of plastic will take close to 1,000 years to decompose in a landfill, even if they are a corn based plastic instead of the traditional petroleum plastic (Atteberry). My tea leaves are always headed out to the compost bin, so it is nice to just toss the bag in as well. Also paper tea bags have come a long way with many companies using unbleached paper coming from sustainably harvested wood pulp. 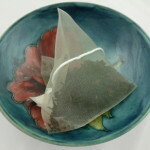 Make your own tea bags with loose tea leaves and single serve paper tea filters. These are great, allowing me to get my tea fix while running late. I can just scoop my loose tea into the filter, pour in hot water and take it with me to steep in the car. I just pull out the tea filter and discard like tea bag. There is no doubt to this traveler that tea bags are the most convenient way to travel with tea. I can put a few into a small ziplock and they fit right in my purse. However, I will totally admit to packing my infuser or paper single serve sacks, a spoon, and a ziplock of my favorite loose tea into my suit case for longer trips. 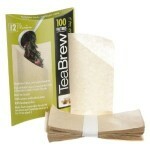 Whatever your tea source, it might be a great idea to have some paper tea filters on hand. You can even prepare them ahead of time using your best loose leaf tea. Simply add the tea, fold them over, and store in a ziplock or recycle an old tea tin to have your tea at the ready. 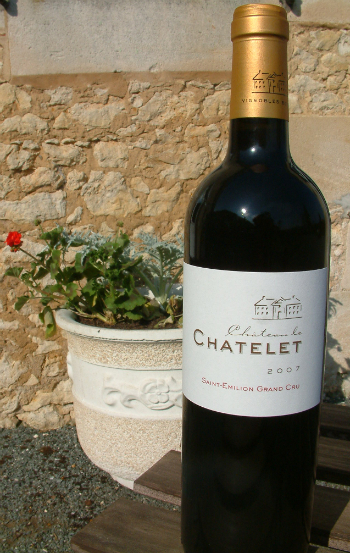 Wine from the Saint Emilion region of France. We are passionate about culture, history, and how many products and values are shaped by the interaction between people around the world. This includes tea, and how it has shaped and been shaped by history and culture over thousands of years. We referenced how the notion of terrior relates not only to tea but to wine and other products as well. On a recent trip to France we were struck by yet another facet of history. The notion that global trade, and the requirements associated with shipping products around the world have led to many of the great products we have today. During our tour of wineries with TéléPro Tour in the Saint-Émilion region outside of Bordeaux, our guide noted that while wine has long been traded with England and others. Over time, innovation led from clay vessels to wooden barrels and at one point someone noticed that the wine shipped from France to England tasted significantly better after shipment. The difference forever changed wine production as producers determined it was the wine aged in oak during transport that produced exceptional flavors and aromas. As a side note, the standard 75 ml bottle we see today came from the fact that the 225 liter barrel makes exactly 300 bottles if the barrel is full. For tea, much like wine, it was the necessities of transportation which led to the development of Pu-erh. As early as 1600 BCE the road between China and Tibet and other locations was long and arduous, travelling over treacherous, high terrain. It was used to transport goods for trade including sugar, salt, tea, horses, and of course culture and ideas. Tea became important to the people of Tibet and similarly horses became important to China for military use. Thus tea and horses were commonly traded via this road giving us the Tea-Horse Road by which it is known today. This nearly 1500 mile journey would have taken a very long time to traverse and efficient transport of goods was a must. So tea leaves began to be packaged into cakes. 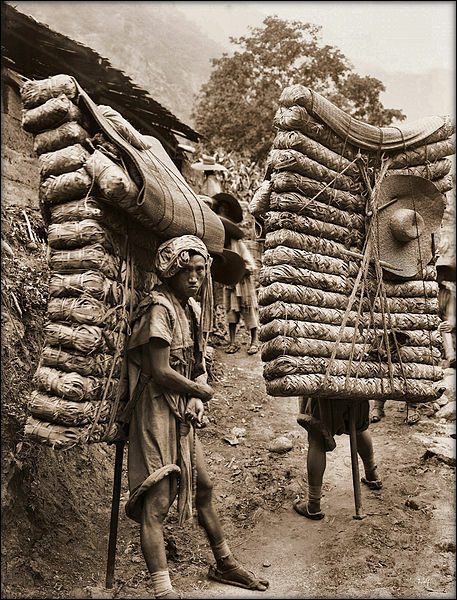 This packaging allowed tea to be compressed and stacked for easier transportation by both man and horse. Like wine, it was discovered that the tea actually had new flavors and aromas after the trip then at the beginning. It turns out that time in the heat and humidity during the long trip along the tea horse road substantially changed the tea resulting in something like the pu-erh enjoyed today. Like aged tea and wine barrels before it, tea bags were also developed by accident as a result of trade between people separated by distance. A far more modern development the tea bag was created by Thomas Sullivan of New York. Upon receiving tea, Mr. Sullivan began to package teas in small silk bags in order to send small samples on to his customers. Not realizing they should take the tea out of the bags some customers simply immersed in water. When they reported back to Mr. Sullivan that the silk was a bit to fine, he realized the opportunity, switched to gauze and the tea bag was born. Yet again, we find ourselves fascinated with tea, how it has been impacted throughout history, and has contributed to global culture. Are there other analogous inventions you might be aware of, tea or otherwise? Start simple with a black, oolong, green or blended tea. If you prefer no caffeine then consider an herbal or rooibos. Loose leaf tea is easy to make: Start with a good infuser or use a good paper filter. 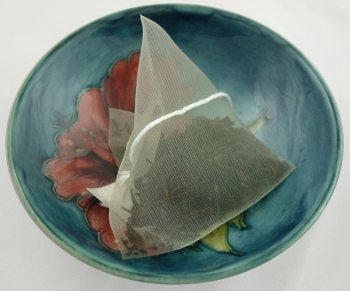 Avoid the stereotypical tea ball and go with something large to allow room for the tea to move around while steeping. If making black, oolong, or pu’erh, use boiling water and steep 1 tsp per 8 oz mug, no longer than 5 minutes. If you are like us, you use a large mug or travel tumbler, so make sure you know roughly how much water is in your mug of choice and adjust the amount of tea accordingly. When steeping green, yellow, and white tea, allow boiling water to cool 3-4 minutes before adding tea. Never use boiling water with these. Use 1 tsp per 8 oz of water for green tea or 1 Tbsp per 8 oz for white tea or yellow tea. Don’t steep any longer than 3-5 minutes. Steep 1 tsp per 8 oz of water for pure herbals (those containing no tea at all), rooibos, and honey bush for 7-10 minutes with boiling water. If the top five list above doesn’t quite satisfy your need, here are a few other things to be aware of. The result of adding boiling water to an emptied, but not really clean, fine mesh infuser. Green tea really does not need to be bitter. The key is to make sure you do NOT use boiling water. With green tea you really want 170-185 degrees Fahrenheit and you don’t want to steep longer than 5 minutes. Steeping at a lower temperature is often better. If you use a fine mesh infuser, be sure to at least rinse it with boiling water before adding a new tea. If you are like us, you are very busy and it’s so tempting to just knock out the last tea leaves and refill. Without rinsing with boiling water you end up with lots of contamination from the last tea you brewed. It pays to pre-heat your mug when steeping black, oolong, and pu’erh teas. Adding boiling water to a mug, especially a ceramic mug, will almost instantly drop the temperature below 200 degrees. If you add boiling water to your mug first, discard, and refill a second time for steeping you will keep the temperature higher for a longer period of time adding to the intensity. Most teas do come with recommended times and loose tea per 8 oz serving size. These more specific suggestions are certainly a better starting point than the general guidance above. However, if you are new to loose leaf tea there really is no need to make it overly complicated. Find something you like, use a good infuser or single use tea filter, and follow the general time and temperature guidance above. As you drink tea more often you might try to start varying the amount of tea you use, as well as temperature and time to see how the taste varies, perhaps finding a combination more to your specific taste. Making tea can, of course, be a lot more involved if you want it to be. We didn’t talk about specialty teapots, gaiwan sets, or the myriad other accessories and techniques for steeping. Nor did we talk about making your own blends or baking tea on your own. These are all topics for another day if and when the curiosity arises. Know someone who could benefit from this post? Please share and help others experience loose leaf tea. And be sure to like us on Facebook or follow us on Twitter for more information on tea, its history, and culture. Last week we looked at CTC Tea manufacturing. This week look at the other major method of tea production, Orthodox. While the CTC manufacturing process is primarily focused on black tea production, the orthodox manufacturing process is used to produce a much wider variety of teas including white, yellow, and oolong as well as green and black teas. Orthodox tea production varies substantially in the actual steps used but generally features hand rolling of tea or use of a machine which mimics the hand rolling process. It does not seek to cut and tear the tea leaves into small particles used in teabags though smaller pieces can be a byproduct of orthodox production. Production by orthodox methods does not necessarily imply manufacturing by hand and many steps, including rolling can involve the use of machinery. Instead tea produced without a CTC machine is referred to as Orthodox. After plucking and, depending on desired product, withering of the raw tea leaves, there is an initial firing to halt the oxidation. In the production of green tea one does not want oxidation so leaves are immediately steamed or fired. Black tea, on the other hand is fully oxidized so undergoes withering in order to start the oxidation process. The firing process may be accomplished in a variety of ways. Pan fried oxidation is traditional in China, while steaming is more traditional in Japan, however there are other methods of firing depending on region, and degree of industrialization of the tea manufacturing process. 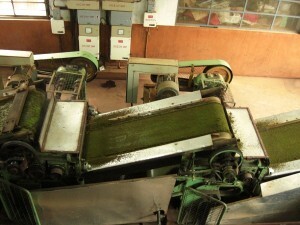 The actual rolling process involves rolling the tea, breaking up the tea to separate the leaves, and rolling again. Very much like kneading dough for bread, this is repeated multiple times depending on the specific variety of tea being produced. 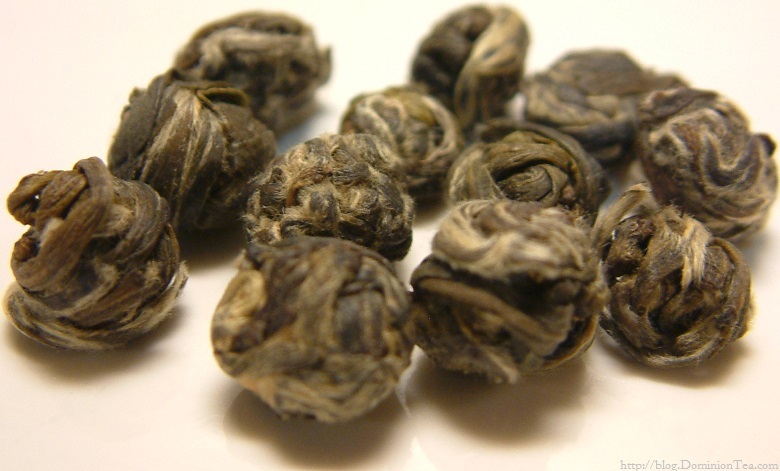 Rolling tea causes the cells within the tea to rupture exposing them to air and allowing the liquids or sap within the leaves and stems to be released. This process helps to produce and enhance the flavor of the tea being produced and can take an hour or more when processed by hand. The liquid within the tea tends to be sticky and as the tea is rolled the leaves will start to stick together. As a result a step often called roll-breaking is required to break up clumps of tea leaves before it is rolled again. Regional differences and qualities of the tea being manufactured will dictate how much the leaf is rolled and special steps necessary to form specific products like Dragon Pearls, Precious Eyebrows, or other shapes. Hand rolling tea is a specialized skill handed down within families and results in unique tea products not found in other parts of the world. 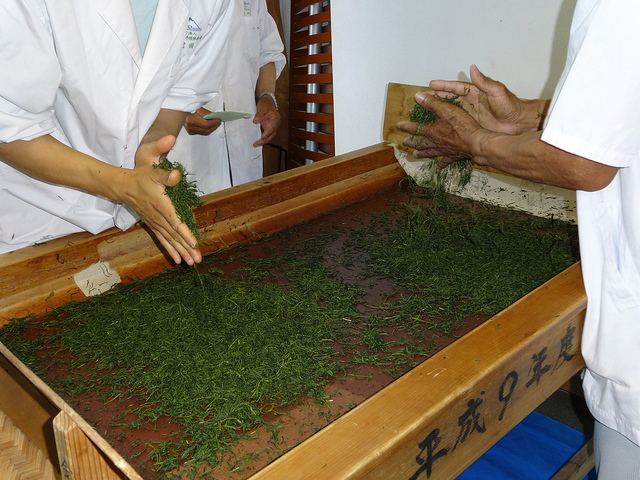 Hand rolling of tea is time consuming and labor intensive with the resulting product more of a work of art. 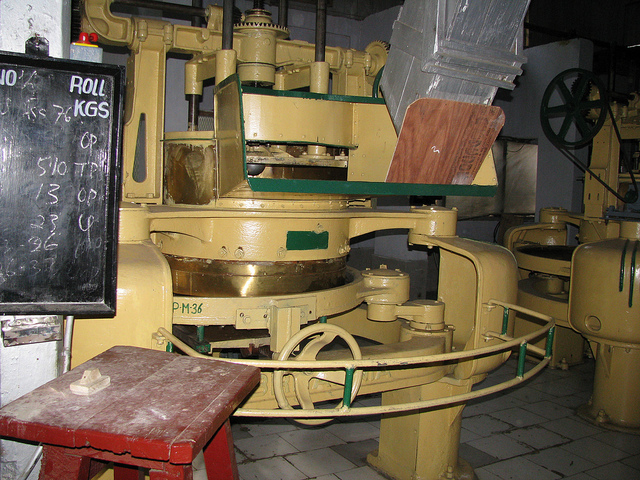 Production of greater quantities of orthodox teas, at lower prices, is sought through the use of rolling machines. These machines consist of a round table with ribs over which the tea is pressed and rolled in an attempt to reproduce the hand rolling process. Factories can scale production of orthodox tea quickly by adding machines rather than relying on artisans who have spent years learning to roll tea. 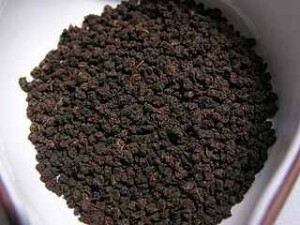 Orthodox manufacturing can result in a tea product in a variety of grades. Indeed the processing of tea by orthodox methods can result in fine specialty teas of whole or near-whole leaf all the way down through broken leaves as well as fannings and dust. So, just as orthodox does not necessarily imply hand processed vs mechanically processed it also does not necessarily imply crafted artisan tea vs fine grades in tea bags. At Dominion Tea we are always curious – Do you look at your brewed tea leaves? What do you see? I enjoy finding a bud and two leaves and thinking about how they can stay attached after being rolled. Do you like what you see on our blog? Share our blog with friends, follow us on Twitter @DominionTea, and like us on Facebook! There are two basic ways in which tea is manufactured for the global market, CTC and Orthodox. The process results in very different end products serving dramatically different needs. CTC tea manufacturing produces small bits of tea leaves that are typically found in tea bags while orthodox manufacturing provides a product with larger tea leaf parts on up to whole leaf. In Part 1 we will look in more detail at CTC tea manufacturing, the product derived from this method, and the consumer products that result. When we get to Part 2 we will examine Orthodox manufacturing methods and the resulting products. CTC tea is defined as “Crush Tear Curl” and is a manufacturing method developed by William McKercher in 1931. By one account McKercher developed this method as a way of producing greater quantities of black tea using more mature, larger leaves which, when prepared with milk and sugar could appeal to a broader market (Srivastava, 2011). Regardless, CTC manufacturing spread widely between the 1950’s and 1970’s as teabags gained popularity. CTC machines themselves are made up of large steel cylinders, manufactured with U or V shaped teeth in them, placed tightly together and turning at different rates of speed. After withering, tea is often pre-processed with a rotorvane, a machine that takes tea from a hopper and causes some initial tearing and crushing of the leaf before passing it along to the CTC machines. The tea is then crushed, torn, and twisted in passing between the steel cylinders of the CTC machine before falling onto a conveyor belt and moving along to another set of CTC rollers. This process can be repeated several times depending on the desired size of the finished product before finally moving along to be fired. A quick word on quality. CTC tea is a very different product from that of Orthodox manufactured teas. The focus for CTC is much more on high volume, large scale tea production with faster oxidation of the product, and consistent taste and liquor appearance. The goal is normally consistent product such that buyers know what to expect with every purchase. The goal with Orthodox production is often very different where the aesthetics of the finished product is important, a wider variety of taste and aroma is desired, and in many cases it’s acceptable or desired to have product which varies from season to season. Therefore, it would really be unfair to hold Orthodox tea products up as “higher quality”. It’s more a question of what the buyer is looking for and if they wish to have greater opportunities to explore variations in tea or if they are just looking for a consistent cup of tea each and every day. What is your preference, CTC, Orthodox, or does it matter as long as it tastes good? Srivastava, D. (2011, September 23). Methods of Basic Research: Issues of Ethics and Plagiarism, http://www.vecc.gov.in/colloquium/dks_lecture.pdf. Kolkata, India.